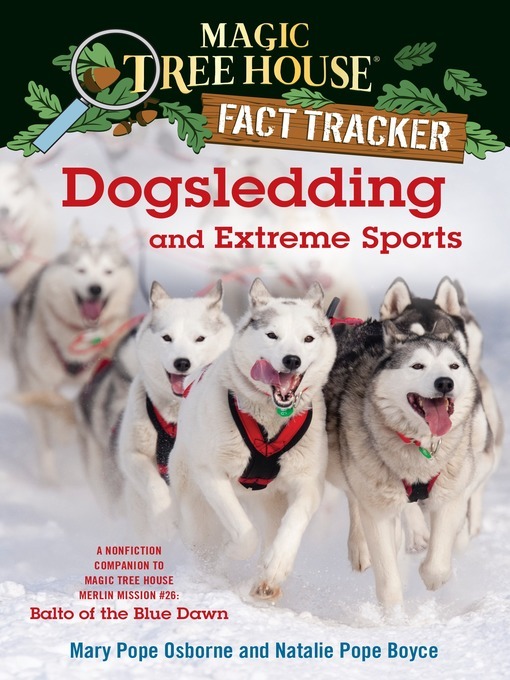 Title Dogsledding and extreme sports : a nonfiction companion to Magic tree house #54, Balto of the Blue Dawn / by Mary Pope Osborne and Natalie Pope Boyce ; illustrated by Carlo Molinari. Description 1 online resource (121 pages) : illustrations, map. Summary "A nonfiction companion to Magic Tree House #54: Balto of the Blue dawn." -- Provided by publisher. Summary Returning from their adventure in Balto of the Blue Dawn, Jack and Annie learn fun facts about sled dogs, the Iditarod and other extreme sports, from the X Games to Ironman competitions. --Publisher's description. Subject Balto (Dog) -- Juvenile literature. Endurance sports -- Juvenile literature. Osborne, Mary Pope. Balto of the Blue Dawn.